Price is £39.39 with Amazon. Haha I remember when I had a 128mb MP3 player back in the day. Room for 2 albums. Bad times. lol 2gb. Isn't that like a modern day version of a floppy disk? And has a screen! Makes the world of difference. Search ebay for sansa clip+. @~£20 it's a billion times better, cheaper, better looking, more internal storage with space to expand, better sound and more options. Also comes in some really nice colours. This is an utter rip off at 30 quid.. I really don't know why people bother posting Apple deals on here. It's just full of haters. Search ebay for sansa clip+. @~£20 it's a billion times better, cheaper, … Search ebay for sansa clip+. @~£20 it's a billion times better, cheaper, better looking, more internal storage with space to expand, better sound and more options. Also comes in some really colours. Better looking? I wouldn't say so, right ugly looking bit of kit. Haha I remember when I had a 128mb MP3 player back in the day. Room for 2 … Haha I remember when I had a 128mb MP3 player back in the day. Room for 2 albums. Bad times. I remember a few years ago when I was working at Dell, when one of my team mates handled a particularly difficult situation extremely well. Good customer service is really all about turning an unhappy person into a happy person by remedying their situation in a way that meets or surpasses their needs or expectations, and my colleague's work exceeded that person's expectations by so much that they were moved to write a letter to head office about it. Letter was received and read, and the guys at the top of the ladder made sure my colleague got a little something special for his effort. So, one afternoon, to minor fanfare, our manager got the team together to tell us all what had happened, and to award our man a special something for his work. He opened the bag to find a Rio MP3 player. 64MB capacity. can anyone tell me if you can use spotify on shuffle or nano ? i dont mean downloaded tracks i mean the offline mode with premium subscription ? can anyone tell me if you can use spotify on shuffle or nano ? i dont … can anyone tell me if you can use spotify on shuffle or nano ? i dont mean downloaded tracks i mean the offline mode with premium subscription ? No you can't. You can only play offline files on a device that supports the Spotify application such as PC,laptop or smartphone. 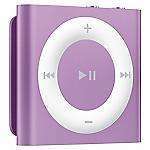 You can put files on mp3 player but it has to be an IPOD and it can only be files you BOUGHT in the store. If spotify allowed people to load their mp3 players with unlimited mp3 music for the price of a months subscription then the record industry would be up in arms. Spotify relies on the fact you never own the files and you can only listen to the songs on set devices. What the frack is wrong with the Apple haters above, polluting the thread with their stream of self-obsessed personal opinions? If you want an IPod shuffle, then you'd want to know about this deal, right? That's all that matters. Whilst you little Hitlers spam us with your obsessional anti-Apple BS, you forgot to mention that neither the Sony or the Sansa have vocal Album or Track announcement, perfect for taking your music or books out cycling, jogging when you want to keep the device in your pocket. We all know its pricey, and lower capacity, but that's why the non reactionaries amongst us wait for deals. Everyone else should get a life. Until recently I have been loyal to Apple (I'm more of an Android man these days), iPods are good at what they do, I love the simplicity of music syncing up with iTunes, it's just the storage space, 2GB will get you a few hours of music, but if you get bored of the songs you already have, you'll be plugging the iPod into your Mac/PC on a constant basis. I remember a few years ago when I was working at Dell, when one of my … I remember a few years ago when I was working at Dell, when one of my team mates handled a particularly difficult situation extremely well. Good customer service is really all about turning an unhappy person into a happy person by remedying their situation in a way that meets or surpasses their needs or expectations, and my colleague's work exceeded that person's expectations by so much that they were moved to write a letter to head office about it. Letter was received and read, and the guys at the top of the ladder made sure my colleague got a little something special for his effort. So, one afternoon, to minor fanfare, our manager got the team together to tell us all what had happened, and to award our man a special something for his work. He opened the bag to find a Rio MP3 player. 64MB capacity. Gutted. Very true. I use my 2gb shuffle for cycling (not all the time tho) and even tho its got a small capacity there are more than enough tracks on there for what I need. I only update it every couple of months or so. Until recently I have been loyal to Apple (I'm more of an Android man … Until recently I have been loyal to Apple (I'm more of an Android man these days), iPods are good at what they do, I love the simplicity of music syncing up with iTunes, it's just the storage space, 2GB will get you a few hours of music, but if you get bored of the songs you already have, you'll be plugging the iPod into your Mac/PC on a constant basis. As your only music device it's not a good choice, but for audiobooks or just the tiny size that you can control without having to take out of your pocket, then If you can get one cheap it's a no-brainer. Remote headphones only do half a job, as VoiceOver is much more efficient at telling you the track/ playlist name. I don't like taking my iPhone in the gym in case I forget it, and this practically weightless too. Horses for courses. Rolls Royces are expensive and get poor mileage, but people still buy them. There are cheaper cars that handle better, but people just accept that personal choice is OK. I think there's a lot going on in he mind of the typical Apple detractor that is self deceptive and egotistical. Likewise, there are numpties that walk about on iPhone launch day conspicuously making calls in public places. Then there's a set of people that do their research and sums and buy what's right for their circumstances. As an owner of a Sansa Clip Zip... It OWNS this. Why is this deal still here? As an owner of a Sansa Clip Zip... It OWNS this. Why is this deal still … As an owner of a Sansa Clip Zip... It OWNS this. Why is this deal still here? Because the Sansa doesn't integrate with iTunes, is bulkier, and you need to take it out of your pocket to navigate through the screen because it doesn't have VoiceOver. Whether you think it OWNS it or it just plain owns it, it's still missing those features. Because the Sansa doesn't integrate with iTunes, is bulkier, and you need … Because the Sansa doesn't integrate with iTunes, is bulkier, and you need to take it out of your pocket to navigate through the screen because it doesn't have VoiceOver.Whether you think it OWNS it or it just plain owns it, it's still missing those features. You don't need to take the sansa out of your pocket. The only time I need to look at my clip is when I'm changing playlist. When you're listening to 1 playlist you can very easily memorize where songs are (when not in shuffle mode) and click 'skip track' a couple of times to get there. The clip doesn't intergrate with iTunes? THANK GOD! Why anyone would want to use that rubbish software is beyond me. Just drag and drop whatever files you want into the clip, simple. Yes this deal is about the iPod shuffle, but there's no harm in advising people on better devices, especially when said devices trounce the iPod in every single department. Cant comment on the sound quality as I never got one of these to work. Was asked by someone who didnt have a PC to rip some CDs and put some tracks on one of these. No matter what I tried this thing refused to work and every forum answer started with why arent you using itunes? Gave up at that point. Conversely bought a sansa clip, intuitive and worked out of the box. So dont believe all the apple makes it easy stuff you hear. (maybe I was unlucky but the fact I could find forum topics asking the same questions pointed to the fact I wasnt the only one). You don't need to take the sansa out of your pocket. The only time I need … You don't need to take the sansa out of your pocket. The only time I need to look at my clip is when I'm changing playlist. When you're listening to 1 playlist you can very easily memorize where songs are (when not in shuffle mode) and click 'skip track' a couple of times to get there. The clip doesn't intergrate with iTunes? THANK GOD! Why anyone would want to use that rubbish software is beyond me. Just drag and drop whatever files you want into the clip, simple. Yes this deal is about the iPod shuffle, but there's no harm in advising people on better devices, especially when said devices trounce the iPod in every single department. Every department apart from size, not having to take it out of my pocket (even to change playlists), and the ability to integrate with iTunes when that's where my media is because I've had an iPod Nano for 6 years, and an iPhone for 3. If you're going to give advice, then state all the facts and don't confuse things with what is actually just your opinion. Cant comment on the sound quality as I never got one of these to work. … Cant comment on the sound quality as I never got one of these to work. Was asked by someone who didnt have a PC to rip some CDs and put some tracks on one of these. No matter what I tried this thing refused to work and every forum answer started with why arent you using itunes? Gave up at that point.Conversely bought a sansa clip, intuitive and worked out of the box. So dont believe all the apple makes it easy stuff you hear. (maybe I was unlucky but the fact I could find forum topics asking the same questions pointed to the fact I wasnt the only one). Starting from scratch, the Sansa might make sense, although you would hope that your device wasn't one of the defective ones that the 1-star Amazon reviews are highlighting. Many users don't have a problem, but the iPod Shuffle has a far lower proportion of negative reviews. The Sansa is a good device as long as you don't get a defective one, loads of storage at a cheap price. I wouldn't get a Shuffle if it was my only device. Every department apart from size, not having to take it out of my pocket … Every department apart from size, not having to take it out of my pocket (even to change playlists), and the ability to integrate with iTunes when that's where my media is because I've had an iPod Nano for 6 years, and an iPhone for 3.If you're going to give advice, then state all the facts and don't confuse things with what is actually just your opinion. ok then, here are your facts. If you've already been using iTunes for 6 years then fair enough, but for those who are new to mp3 players or those that want a change from using iTunes (I've used it, it's a headache), the clip is a no brainer. ok then, here are your facts.Size iPodclipChanging playlists? … ok then, here are your facts.Size iPod>clipChanging playlists? iPod>ClipLooks = opinionPrice Clip>>>>>iPodStorage Clip>>>>>iPodExpandability Clip>>>>>iPodAudio Quality Clip>>>>iPodScreen Clip>>>>>>>>>>>>>>>>>>....>>>iPodPlaylists on the go Clip>>>>>>>>....>>>>iPodTransfer Drag and Drop>>>>>>>>>>>>>>>>>>>>>>>>>>>>>>...>>>>>>>>>>>iTunesSoftware Rockbox>>>>>nothing?Equalizer Clip>>>>>>>>>nothing?Need I go on?If you've already been using iTunes for 6 years then fair enough, but for those who are new to mp3 players or those that want a change from using iTunes (I've used it, it's a headache), the clip is a no brainer. So it's bigger than I want and doesn't have the features I need, but has a huge list of other benefits that someone else might like? Well thanks mate, now go on every other deal posted today and work your magic on them too. How about deals to Canada? Never mind that I'd be glad to see my relatives cheaply, tell me where I SHOULD be going.